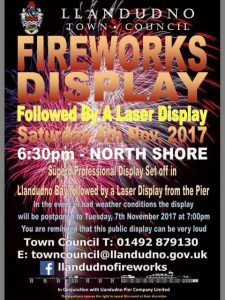 Llandudno town fireworks display is back on Saturday 4th November 2017. The fire works display starts at 6.30pm and is followed by a spectacular Laser display. For the first time Llandudno Pier will be fully open to the public on Fireworks Night. The Pier will be open from 10am until late. So why not come and enjoy the best view in Llandudno from the Pier. All our Food & Drink outlets & Arcades will be open for you to grab a hot-dog, special hot chocolate or a pint and enjoy the display. After the excitement of the display why not try your luck in one of our arcades. They will both be open until late.